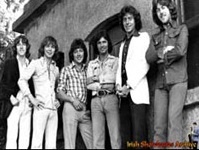 Sometime after 2.30am on July 31 1975, five members of the Miami Showband were travelling back to Dublin on the road between Banbridge and Newry when they were stopped in the townland of Buskill by what they thought was a routine UDR (Ulster Defence Regiment) military checkpoint. What followed was the slaughter of three of the band members and the unintentional exposure of the involvement of British military personnel in directing and assisting unionist death squads in their murder campaign. Earlier that night they had played a gig at the Castle Ballroom in Banbridge. Following the gig, the band loaded all their gear onto their equipment van driven by the bands road manager. One of the band members, drummer Ray Millar, headed off in his own car to Antrim to stay the night with family. The other five boarded the band’s van and started off on the trip home to Dublin. When they were stopped, they were directed into a lay-by where they were taken from the van while it was ‘searched’. They were ordered by one of the UDR gang to stand over beside a hedge and to give their names and other details. As the ‘search’ of the van continued, another member of the gang appeared on the scene. According to the testimony of two of the Showband survivors, Stephen Travers and Des McAlea, this man, who was clearly in charge and barking orders at the others, was a British army officer with what they described as a “crisp English accent”. Stephen Travers was concerned that the two UDR men who were ‘searching’ at the back of the open van would damage his guitar and tried to go over and warn them to be careful but he was bundled back into line. Just then, a bomb that the gang were trying to hide in the van exploded prematurely, throwing the band and gang members close to it in all directions. Two of the UDR members, Wesley Somerville and Harris Boyle, died instantly in the explosion. They were also senior members of the illegal UVF (Ulster Volunteer Force). The UVF gave them a full paramilitary funeral, including a volley of shots, in a ceremony that was conducted by the DUP MP Willie McCrea. None of the band members were killed in the bomb blast. Des McAlea was thrown over a ditch by the force of the explosion, suffering only minor injuries and managed to make good his escape across fields. Fellow band members Fran O’Toole, Tony Geraghty and Brian McCoy were not so lucky. While they survived the blast, the gang were intent on killing all of the band to eliminate any witnesses who might have been able to identify them as responsible for what had happened. The gang opened fire on the band members, who were dazed and in shock following the blast. Stephen Travers was hit in the initial gunfire and was seriously wounded. Both Tony and Fran had tried to carry him off to safety but they were unable to and tried to make their escape themselves. As Stephen lay there, he could hear the UDR men chase down his friends in the fields and murder them despite their pleas for mercy. Brian McCoy, hit nine times by machine gun fire, was the first to die. Tony Geraghty was shot four times in the back. Lying helpless on the ground, band frontman Fran O’Toole died after being shot in the face 22 times. One of the British soldiers waded though the aftermath of the explosion, kicking at bodies to ensure that they were all dead. Seriously wounded, traumatised and terrified, Stephen decided to lie still and pretend to be dead as the soldier approached. Luckily for Stephen, just as he came near him, one of the other soldiers shouted that “those bastards are dead. I got them with dum-dums”. The British soldiers then departed the scene and, despite suffering horrific injuries, Stephen survived the attack. Among the other UDR soldiers involved in the massacre were James Somerville, a brother of Wesley who was killed in the blast, as well as Thomas Crozier and Rodney McDowell. These men, along with a host of other RUC and UDR men, were all part of what was known as the ‘Glenane gang’, a notorious UVF unit operating in the Mid-Ulster area in the mid 1970s and responsible for countless other sectarian atrocities in the area and across the border. That unit, led by Robin Jackson (known as ‘the Jackal’), were involved in a bomb attack in Dundalk in 1975 that resulted in two deaths and dozens of injuries and the Dublin/Monaghan bombings that killed 33 people and injured more than one hundred. The weapon used to kill Brian McCoy was the same weapon used in the assassination of IRA volunteer and Long Kesh escapee John Francis Green six months beforehand in county Monaghan. According to a number of former British army intelligence operatives, Robert Nairac a member of the British army’s undercover 14th Intelligence company, was working with the Glenane gang and was involved in the planning and carrying out of the John Francis Green assassination as well as the Miami Showband massacre. The political establishments on both sides of the border may be willing to dismiss the Miami Showband massacre and other atrocities such as the Dublin/Monaghan bombings as the actions of “rogue” British soldiers, RUC men or intelligence operatives. However, the evidence, the refusal of the British government to come clean and co-operate with the Barron inquiry into the Dublin/Monaghan attacks and the record of British military involvement in Ireland shows otherwise. The history of the British army in Ireland has been a shameful and bloody one. Both directly, and indirectly through collusion with their allies in the unionist death squads, the Crown Forces have consistently engaged in terrorising the nationalist community and those opposed to the British occupation of Ireland. Collusion has been central to Britain’s policy of maintaining their occupation of Ireland. Since the foundation of the Six County state, nationalists and republicans have lived with the reality of the British state actively assisting unionist death squads. The list of victims of British collusion is lengthy and includes Pat Finucane, Rosemary Nelson, Sam Marshall and Eddie Fullerton to name just a few. All attempts to establish the truth about collusion between the British occupying forces and the unionist death squads has been hampered and blocked by the British state. They refuse to reveal their full role in atrocities such as the Dublin/Monaghan bombings and continue to deny truth and justice to the victims’ families. Despite this, these families continue to campaign tirelessly to find the truth. Once again, eirigi pays tribute to the families’ determination and fully support their efforts to achieve the truth and justice that, for too long, has been denied to them.